Image Size: 22"w x 32"h.
The indispensable ingredient crucial to the people of the Plains and Mountain tribes, either wholly or in part, was the buffalo, ni-tapi-waks-in (real meat). By the late 1870s the time of the great herds was nearing an end, making it difficult for those who depended upon buffalo for subsistence to locate huntable numbers. Here, two resolute Blackfeet hunters scan for signs of buffalo near Red Blanket Butte, Montana Territory. 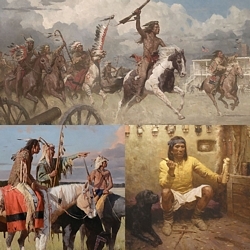 A friend arranged a model session for the artist with two Piegan Blackfoot men so that the buffalo scout theme could be pursued and created anew. This special meeting took place near the eastern front of the Rockies on the Mad Wolf Ranch, located on Cut Bank Creek in northwest Montana.